And here we are at the end of the season. It’s been…uneven. It was the best of times. It was the Papa Poutine of times. Or, considering how much I have unenjoyed his storylines, it might be better to say that it was the Hiram Lodge of times. On that note, let’s get the good news out of the way, since there’s so little of it. 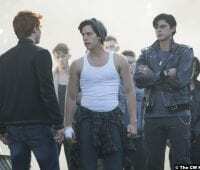 Jughead is alive, as we all expected, but it turns out that Fangs is, too. The rumors of his demise were all Hiram’s doing. And that’s it. 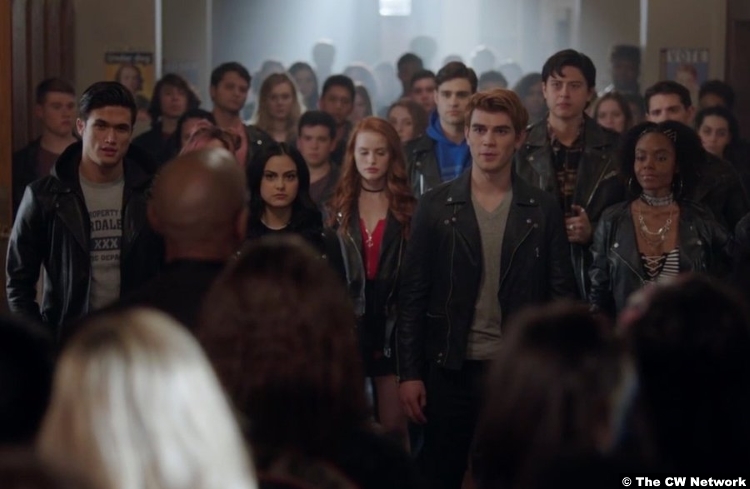 That’s pretty much all the good stuff that happened, minus Archie being elected student council president and the newly emancipated Cheryl being given a red Serpents jacket. They’ll need all the Serpents they can get, considering they lost their battle with the Ghoulies. 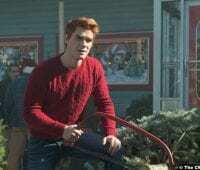 FP and Jughead still have their home, but most of the trailer park is in smoking ruins. Some of the Serpents left town and others are crashing at the Whyte Wyrm. 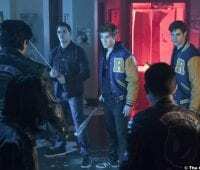 The remaining Serpents students are going to be transferred to It Doesn’t Matter High as an unofficial punishment for vandalizing the school during the riots. 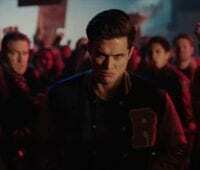 There is an unified front presented in response–the original Riverdale students successfully stand with their newer classmates in protest and Fred opens the Andrews home to the displaced Serpents. It might have cost him the election–Hermione will be the new mayor–but that’s the kind of decent man Fred is. 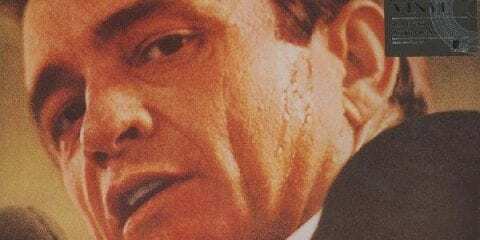 So who would shoot a decent man? That’s one of the lingering mysteries for this episode–the identity of the Black Hood who strafed the town hall meeting and took a shot at Fred. As you’ll recall, we know it’s not Hal, because he was in the audience at the town hall and in custody when Fred was shot. Luckily, Sheriff Minetta solves that case in five minutes. It was obviously Tall Boy. Look, we found the guns at his house and a black mask. No, you can’t question him, because he was killed in a subsequent gunfight :(. But speaking of Black Hoods, Betty does go visit her father in his weirdly Silence of the Lambs-style cell. He’s still claiming that they share the same darkness, but she’s able to walk away and gain a small amount of closure. Speaking of Hiram’s nonsense, though, it turns out the for-profit prison isn’t the only thing he has up his sleeve. The prison is just a conduit, a pipeline, for drugs and Penelope Blossom’s upcoming bordello. Yeah, that’s right. Hiram has assembled an injustice league comprising Penelope, Claudius, Penny, Malachai from the Ghoulies (Tommy Martinez), and Sheriff Minetta. That ain’t good. So the kids think they’ve gotten one over on Hiram by buying the Whyte Wyrm out from under him, but this is a game of chess and he’s like, 12 moves ahead. Veronica trades the Wyrm to him for Pop’s and it’s played like it’s a victory for her, but she also gives up everything–her stake in Lodge Industries, her allowance, etc.–for it. Those Ted Baker frocks aren’t cheap, Ron. You’d better hope that your new cabaret in Pop’s basement is uber profitable. Of course, she might want to start shopping consignment, because Archie’s going to need a good lawyer–beg pardon, a good defense lawyer (sorry, Sierra McCoy). 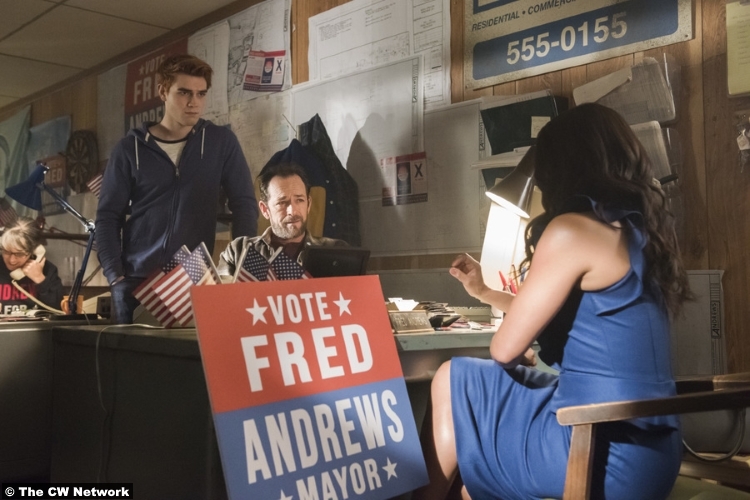 Because right as the school is celebrating Archie’s coronation as student council president, the sheriff and his deputies appear to arrest Archie for murder. You know that townie Andre killed when the kids went on that boring vacation to Lodge Lodge? Yeah, that’s the victim. 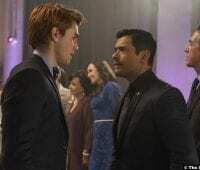 And since Hiram has appeared in the gym to watch this all unfold–do you not have business?–there’s probably some stupidly compelling evidence out there. Well, we’ll find out in season 3. 7/10 – While it seems wildly naive for the kids to be acting like everything is going to work out, they deserve to take a breath once in a while, especially now that Jughead is the new Serpent King (*electric guitar riff*). And hey, it frees up Archie to do some thinking this week. Finally, he’s figured out completely how Hiram manipulated him in the wake of Fred’s shooting and he’s broken away. Of course, that just puts a target on his back. But he’s faced killers and he lived next to the Black Hood. He can handle this. Probably.